Designed and published by Cryptozoic Games. Released November 11, 2015. Review copy provided by publisher. 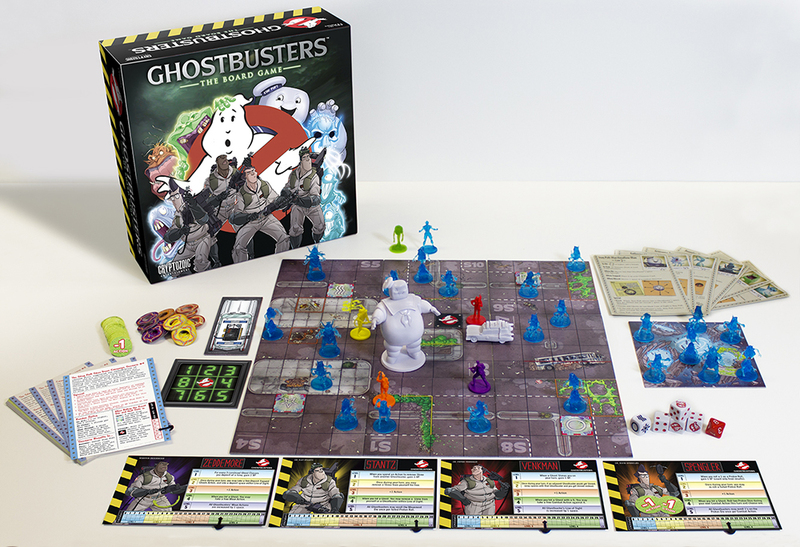 Ghostbusters: The Board Game includes three episodic campaigns that bring players together in a unified battle against all of the ghosts from the Ghostbusters' past. The story is laid out in the manual, and tells of a young woman who has accidentally freed Idulnas, the third minion of Gozer. Idulnas has emptied the Ghostbusters' Ecto Containment Unit, freeing all of the ghosts they had captured up to that point. In a dire warning of what is to come, Idulnas proclaims "I bring the vengeance of every being you've ever captured or banished, Ghostbusters. I bring you Hell itself." It appears that the city is headed for a disaster of biblical proportions. Human sacrifice, dogs and cats living together, mass hysteria. With that tone set, let's jump in! Each player assumes the role of one of the four Ghostbusters - Egon Spengler, Ray Stantz, Peter Venkman, and Winston Zeddemore. Each player is granted two action points (three if their character is Level 3 or higher), which can be used to move, drive, deposit trapped ghosts, remove slime, or enter into combat. Combat can be initiated when a ghost is within your line of sight (within three spaces of your character). Each character can be leveled up throughout each campaign in order to unlock new abilities that can be used to benefit the team on any given mission, to move around the board more quickly, or to grant advanced ghost-fighting attacks. The base Level for each character allows for individual XP increases in varied situation (for example, Peter gains 1 XP when slimed by a ghost on his turn), where the highest Level, Level 5, adds perks for the entire team (Egon gives the ability for all Ghostbusters to reroll the Movement Die once for every failed Proton Roll). It's designed in a way to encourage cooperative play throughout the course of the game, not only in achieving the desired outcome but also in gradually contributing to the strength increase of your teammates in order to make the entire group stronger. XP does not deplete between scenarios within the same campaign, ensuring that each player has leveled up their character in anticipation of any given episode's final boss. Unfortunately, there is a notable balancing issue with leveling up. During one playthrough, for example, my teammate had already maxed out his XP with Stantz by the end of the second scenario. Each session can last anywhere from 30 minutes to several hours through the merging of multiple scenarios. The first campaign felt slow and almost brutally simple to start, so the team split up in order to hit the four corners of the board in order to close gates quickly, with very little cooperative play needed. The fourth scenario, however, pitted my team and I against the nefarious Slimer, giving us a taste of drastically increased difficulty. After each player's turn, Slimer would advance one space, making his way around the board in order to collect slime. Each time he collected slime, the number of streams needed to defeat him increased, and the level was lost once he collected the last piece of slime. We failed our first attempt because we underestimated the speed with which Slimer was moving, and realized we had to drastically change the way we had been playing in order to successfully complete the scenario. This led to many dirty words being yelled across the table. Each scenario that followed that forced us to evaluate how we would approach the issue. Occasionally we would leave someone to operate the Ecto-1, other times we would split up, and occasionally we would go in groups of two. This is one of the greatest parts about Ghostbusters: The Board Game - it doesn't get stale halfway through. The game is constantly changing, and demands the players to change with it. The board is comprised of 10 two-sided tiles that are laid out in specific orientations based on the scenario being played. The design is attractive, and the coloring makes it simple to identify challenges and barriers at a glance. Each scenario has the Ghostbusters tasked with closing gates, among other tasks, in order to prevent new ghosts from being able to spill from the Spirit World onto Earth. At the end of each round an event die is rolled, and determines a specific action that will take place from one of the gates on the board, with the event determined by whether the gate in question is open or closed. These events change from one scenario to another. In addition to the 15 included individual scenarios, there is also a random scenario generator available through Cryptozoic's website, which can be tailored to your group's level. 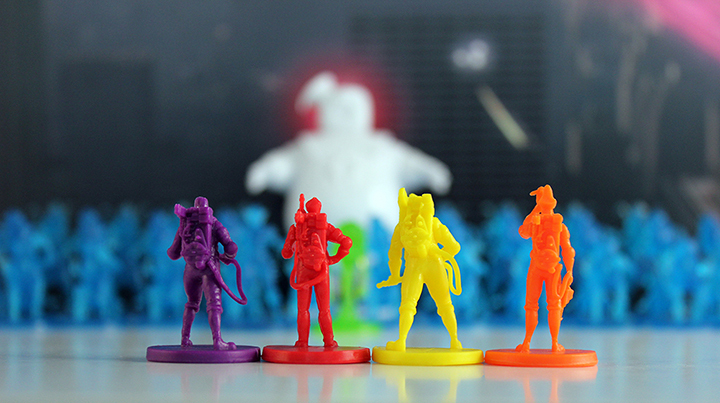 My biggest complaints for Ghostbusters: The Board Game come from a design perspective. The ghost pieces are smooth and soft, and all boast the same blue color, making it difficult to tell at a glance what battle you're making your way into. Considering the ghosts were each designed with different behaviors and requirements for defeat, quickly establishing what is what would be beneficial to game progress. Additionally, while the Stay Puft Marshmallow Man and Slimer are easily distinguishable from other pieces (Stay Puft is large and white, while Slimer is green), the third major villain, Idulnas, is the same color as, and similar in size to, the basic ghosts in the game. If you ask me, the guy responsible for emptying the ECU and waging war on the Ghostbusters should at least be a different size than the other ghosts. My primary concerns prior to playing were whether the game was respectful of its source material, and whether the game would rely too heavily on nostalgia. On the first point, Ghostbusters: The Board Game pays a deeply reverent homage to the films and comics that predecessed it. The individual characters in the game feel similar to how the characters have previously been portrayed, particularly in their abilities. Additionally, the enemies are familiar, and the story feels entirely plausible in the Ghostbusters universe. While I do believe nostalgia will be an integral part of the game's success, the gameplay does stand on its own. However, it does seem odd that a game based on Ghostbusters doesn't have a rule about crossing the streams. 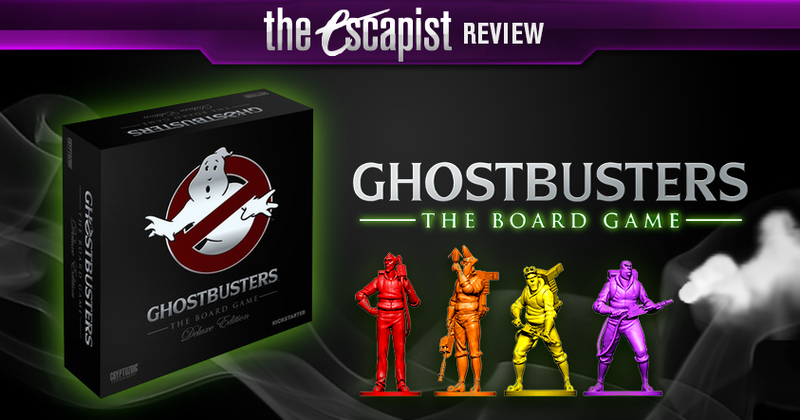 Bottom Line: While I have some minor complaints regarding balance and design, Ghostbusters: The Board Game is a fun, well executed, and reverent addition to the Ghostbusters legacy. It's a great co-op experience that is quick to pick up and can be adjusted in order to accommodate a quick game or a longer experience. Recommendation: If you're looking to dip your toe into tabletop gaming, or even if you're just a Ghostbusters fan starved for new content, this game could be the perfect addition to your gaming library.